Roast duck is one of my favourites when it is done correctly, and I have worked out that if I cook it slowly, the meat is more tender. 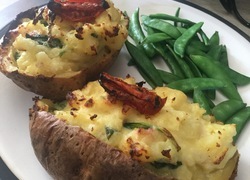 With it I made Boulangere potatoes which I did because it was one of the few recipes I make that does not have milk or cheese in it, and I had a visitor who is allergic to both these foods. I also made some roast vegetables. Turn the oven on to about 175°/155° fan forced. Rub some garlic inside and out of the duck after thoroughly cleaning it inside and drying it thoroughly. Cut up some of the orange pieces and put inside, taking care not to fill the duck too full as air needs to get in to cook properly. You may have to put sprayed silver foil over the wings of the duck to stop them burning, and take this off the last hour. Bake on a rack in a roasting tray for about ¾ hour, depending on the size. Put the carrot and pumpkin in the bottom of the roasting pan. Chop up the lemon and put inside the chicken after cleaning and drying it thoroughly. Rub with salt and some oil, and put in the oven with the duck. Bake in the oven for about an hour, or as per packet instructions, turning once or twice for both birds. I made mine in the morning as I always find it difficult to cut when the visitors are there and it is hot. So I let it cool down, cut it all into pieces, and put it back in the oven about 10 minutes before the visitors were due. Discard the lemon, but the orange can be eaten. Preheat the oven to about 200°/180° fan forced, and lightly grease a 1 litre shallow ovenproof dish (I used Corning Ware). Arrange a single layer of overlapping potatoes in the base of the dish and add a bit of the garlic and some salt and pepper. Repeat the layers with the remaining potatoes, the garlic, and the salt and pepper. Pour the chicken stock over the potato and bake for 1 hour, uncovered, or until the potatoes are tender and the top is crisp and golden brown. Serve the chicken and duck with the roast vegetables and some of this delicious potato! 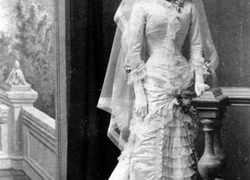 Did you have a white wedding, with a veil, and did you wear something blue?